After a long day at work or when relaxing with friends and family on the weekend, there’s no better way to unwind than over a glass of your favorite alcohol. Want to take your drinking game to the next level and impress your company with some real stopping power? 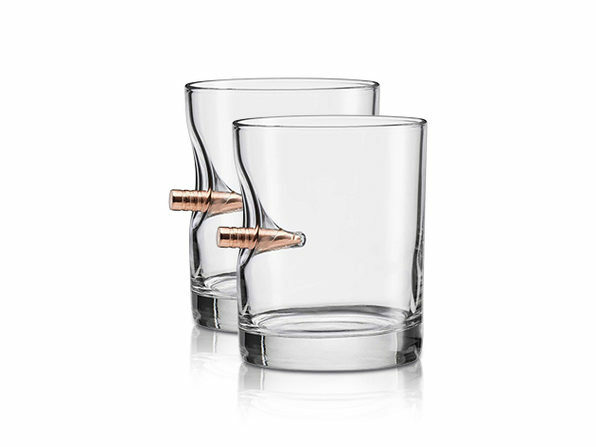 With the BenShot “Bulletproof” Rocks Glass Gift Set, get two unique, “bulletproof” glasses. These special glasses make for a fantastic conversation starter and a wonderful holiday gift. For starters, each glass is embedded with a real, solid .308 copper bullet. Meaning, the glasses have real stopping power to them, acting as the start for many fascinating discussions and all the makings of a wonderful Christmas gift. What’s more, thanks to the lead-free design of the bullet, each glass is safe to use to drink. Even better, by getting this set of two glasses, you’ll also be supporting American business. Handcrafted in Wisconsin, with all packaging and raw materials made in the USA, these rock glasses — each of which is unique — are 100% American. On top of all that, since each one holds up to 11 oz of your favorite liquid, it’s easy and enjoyable drinking your fill with a glass that perfectly captures your strong spirit. Get this set of two for 11% off at $35.50 in The Daily Caller Shop.